Central and Eastern Europe has suffered more than most regions as a result of the credit crunch. Some are concerned that economic turmoil may lead to social unrest. Ukrainian prime minister, Yulia Tymoshenko, is one of many leaders who have balked at IMF demands. With their own economies in disarray and the prospect of their primary markets in Europe and beyond slipping into recession, many of Central and Eastern Europe’s young democracies are facing an uncertain future. Heavily reliant on external debt to fund their growth—and their free-spending populations—these nations are now confronting the reality that they may have bitten off much more than they can chew in their headlong rush to create free-market economies. Many observers believe the economic turmoil Central and Eastern European countries are enduring now has the potential to cause long-lasting political damage to the region. Added to that, painful cuts to budgets, advocated by the International Monetary Fund, among others, may foment social unrest that will provide a breeding ground for wider dissent. Analysts say the manner in which Western multilateral and economic agencies advocate and push through radical salvaging measures for the region’s governments, which are desperate for their money but politically unstable, will be critical over the coming months. So, too, will be the way in which those governments explain to their electorates that the good times could not last. After seven years of feasting, they now have to endure several years of famine, something that might help Russia’s friends in the region gain greater control. Russian leaders have been redoubling their efforts to widen their sphere of influence throughout the region. Prime minister Vladimir Putin’s government has encouraged business leaders to set up or acquire businesses in neighboring countries as part of this economic expansion, says Andriy Bespiatov, a financial analyst at Dragon Capital in Kiev. Most recently, one of Russia’s largest banks, Vnesheconombank (VEB), acquired an ailing Ukrainian bank, Prominvest, spending $1 billion for its assets. Bespiatov says this was by far the largest acquisition of a Ukrainian bank by a Russian institution and could indicate a more interventionist strategy. While that may be unnerving for some, difficult credit conditions have hit countries of the region particularly hard, and their governments are prepared to accept foreign capital from any source. The Baltic states, such as Latvia, are regarded as particularly vulnerable to political instability as a result of recent economic turmoil. In an attempt to stabilize the situation, last December Latvia requested a 27-month standby arrangement from the IMF for $1.7 billion under the IMF’s Emergency Standby Mechanism. The request followed a run on the country’s second-largest bank and growing fears that depositor mistrust would spread to the entire banking network. The IMF agreed to the request, saying the program’s main objectives were “to arrest the immediate liquidity crisis and then to ensure long-term external stability, while maintaining the exchange rate peg.” The program includes measures to stabilize the financial sector and restore depositor confidence but demands “substantial fiscal policy tightening” of the Latvian government. Latvia, like Georgia, Bulgaria, Hungary and Ukraine, had experienced five years of remarkable, but ultimately unsustainable, growth. To fund the growth, the countries borrowed heavily from the capital markets, so when the crunch came, their treasuries were bare. These countries were facing the very real prospect of default unless they could find a source of dollars. Russia would be in the same position but for its reserves of petrodollars with which the state has been bailing out Russian companies with heavy foreign currency exposure. The demands that the IMF is placing on its new CEE clients are causing a sharp rise in tension across the region. Budgets are already under pressure from currency depreciation, which means countries have to spend more of their domestic currency to cover dollar-denominated borrowings. At the same time, the IMF is pressing governments to slash social spending as a precondition for its support. For many politicians the IMF requirements are too demanding. Yulia Tymoshenko, the Ukrainian prime minister, recently stormed out of a meeting with the IMF when it advised the Ukrainian government to restrain its budget. Pressure on domestic budgets is adding to anxiety about growing protests among workers and the poor. These have already occurred in Russia and the Ukraine. There are now fears that dissent among the newly unemployed—and even the middle class, whose houses have been repossessed—will prove contagious. Many observers are concerned that this opposition to the relatively fragile democracies in the region will help Russia increase its influence throughout Central and Eastern Europe. The widespread currency declines are having the same impact at a micro-economic level on the capacity of borrowers of dollar-denominated loans to service their mortgages and other bank borrowings. The IMF is putting pressure on central banks across the region to rationalize and recapitalize banking systems that have burgeoned over the past five years. Ukraine, for example, has seen its financial assets double each year since 2004 as banks have extended loans to individuals and corporates. The concern is that the speed of growth will be matched only by the speed of the ongoing contraction. Banks in Latvia, for example, are braced for a sharp rise in defaults, suggesting the size of the non-performing part of their loan portfolio could grow to a minimum of 10%. More pessimistic voices do not rule out 20%. 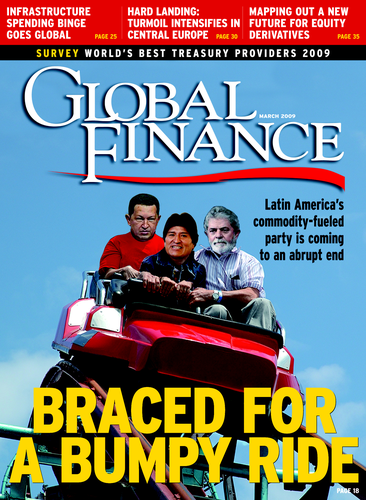 There will be two variables in the extent of state ownership: first, the size of the banking sector and the number of systemically important banks inhabiting it; second, the rigor and confidence of a state’s regulator and central bank in imposing IMF requirements for bank closures and recapitalization. Those IMF measures make clear economic sense. The issue for politicians both in Washington and across Central and Eastern Europe is whether they can be implemented without posing a threat to many nascent and insecure democracies.